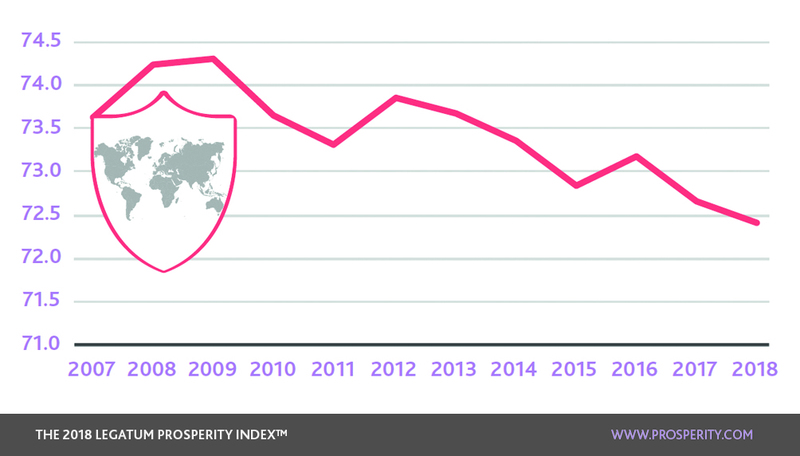 Global prosperity continues to rise and is at its highest ever point; the median score has moved up the equivalent of 15 places since 2007. 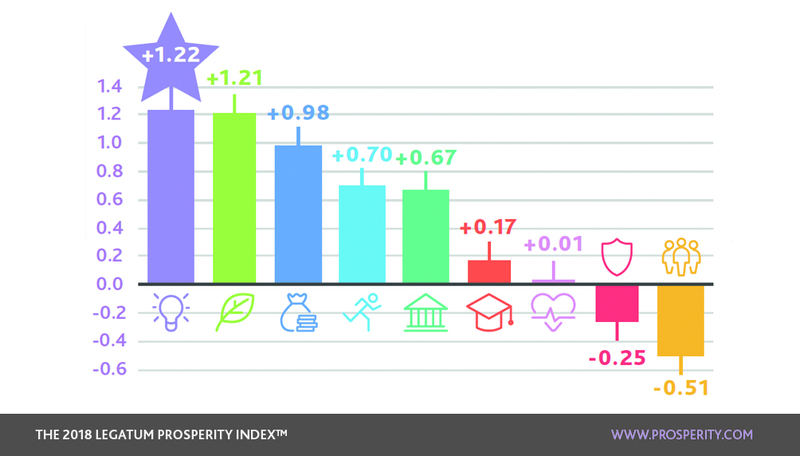 Since 2013, 113 countries have improved their Prosperity Score, and since last year 95 countries improved their score. However, this improvement is not shared equally. 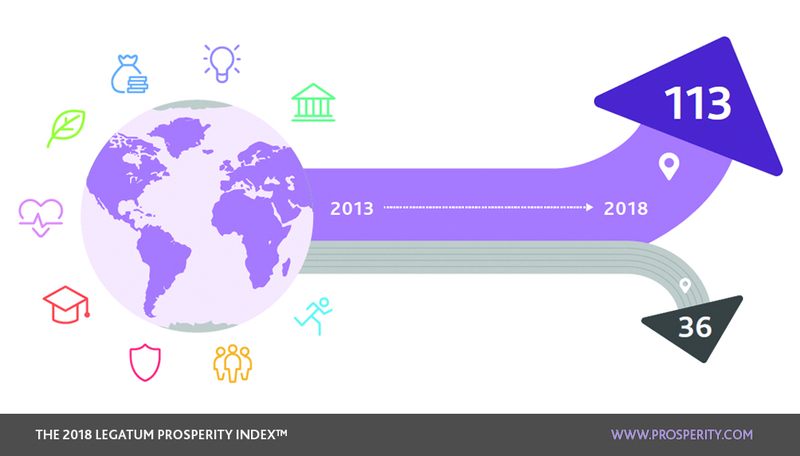 113 countries have improved in this years rankings, with 36 countries falling. Business Environment has seen the largest one year gain at a global level, having risen in every region. The greatest 10 year gains have been in Asia, Sub-Saharan Africa and Eastern Europe, and one of the main drivers is an improvement in the entrepreneurial environment in these regions. Sub-Saharan Africa in particular has seen the largest improvement in the ease of starting a business. North America was the strongest region this year, and improved primarily due to improved Personal Freedom, Governance and Economic Quality. 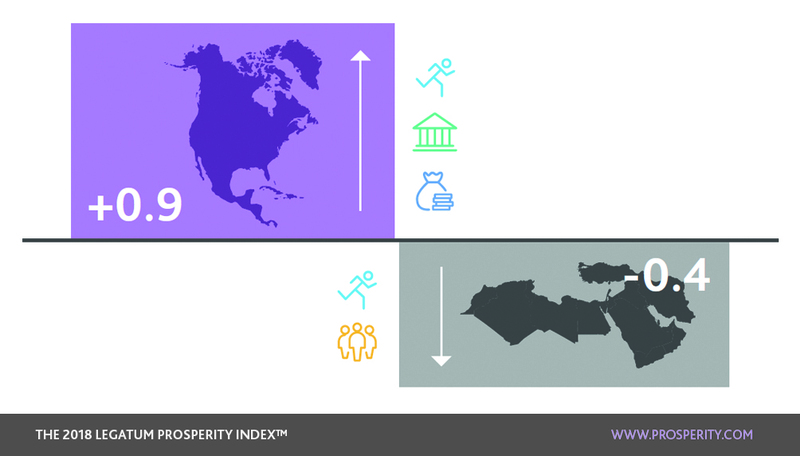 MENA experienced the largest fall, due largely to worsening Personal Freedom and Social Capital. In particular, MENA has seen worsening basic legal rights this year, due to a fall in the civil liberties indicator. Safety and Security continues to fall globally, and in five out of seven regions. This is driven primarily by falls in the security of people’s living conditions, with the largest falls in Latin America and the Caribbean due to fewer people reporting that they could afford sufficient food and shelter. There has also been a small increase in the number of terrorist deaths this year, which continues a long term trend for this indicator. It is the only pillar that has a lower score in 2018 than in 2007. Eastern Europe is one of the strongest risers this year. 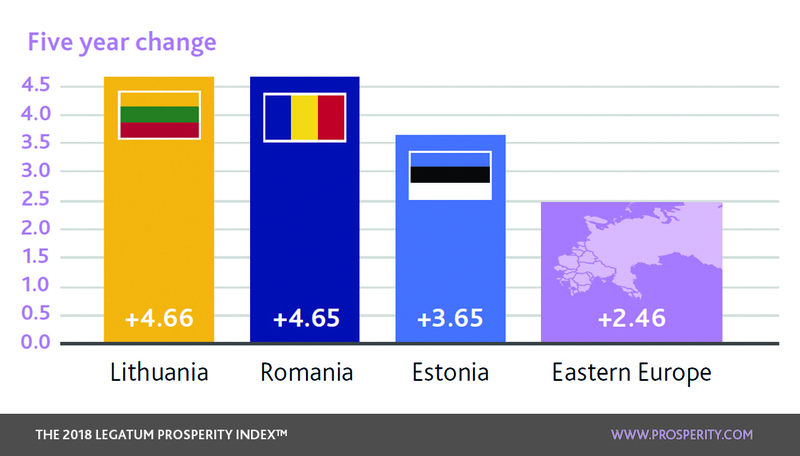 This is due to improvements in Business Environment, Natural Environment and Personal Freedom, with Lithuania, Romania and Estonia seeing the largest rises in the last 5 years. It is the fourth placed region overall, with its best ranking in Education, where it is the third best region in the world. 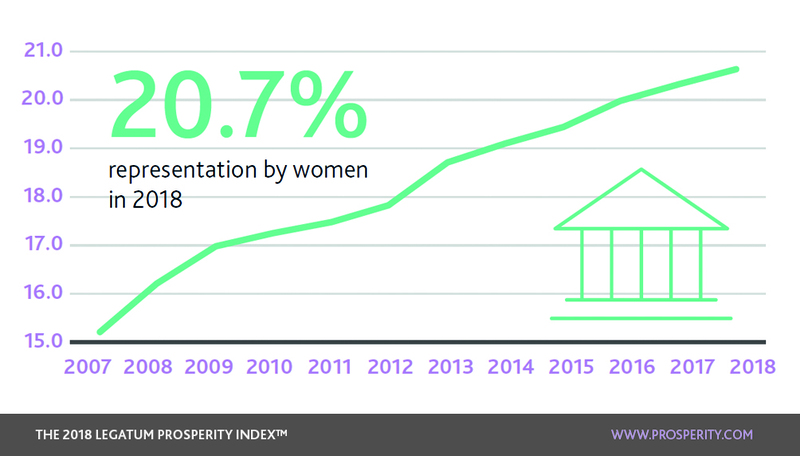 The number of women in national legislatures around the world has been increasing steadily over the last decade, increasing from 15% representation in 2007 to 20.7% in 2018. Rwanda has the largest proportion of women in parliament, with women holding 49 out of 80 seats. MENA is the lowest ranked region, with just 16% of its seats held by women.